The Department of Residence Life has identified the importance of collaborating with academic and student affairs units to promote the success of our students. As the Department, we value scholastic environments and opportunities that enhance academic success. Recognizing that academic and student affairs collaborations support such success, we encourage intentional interactions or integration of residential education efforts with the student persistence and success efforts. Descriptions of types of collaborations in which the Department of Residence Life engages are outlined below. Additionally, some examples are included for each category. Commencing engagement at a lower level, focus is on the immediate rather than the long-term in services, facility use, and/or funding. sponsorship of on campus students to attend a program/event. Units engage in a partnership that results in a mutually beneficial exchange beyond facilities and funding, but does not constitute a long-term, coordinated relationship between the units. typically one time use of someone’s expertise. Units engage in a coordinated relationship, where roles are designated by independent expertise and responsibilities are shared over a long-term, recurring relationship between units. Units share full responsibility in an integrated partnership which includes planning and researching, financing, decision-making, coordinating and assessment of project or experience. This partnership is often a long-term and sustained coordinated relationship that is mutually beneficial for the units. shared staff with academics areas. Our campus collaborators make transformative experiences possible in our residential communities. Below are our current campus collaborators and their respective collaboration. Academic Success Center - Office of the Associate Provost of Undergraduate Studies Cooperation Residential Tutoring - Provides tutoring services to students in convenient locations on campus, Sunday - Thursday from 5:00 p.m. - 9:00 p.m. 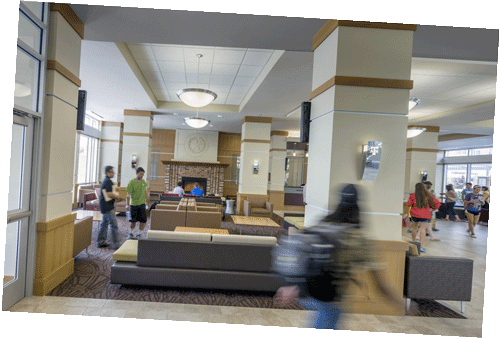 The Academic Success Center provides to tutors while Residence Life provides compensation and space. LAUNCH: Learning Communities Collaboration LAUNCH sponsors a variety of Living Learning Communities housed with Residence Life. Falling under the same umbrella of support, these communities benefit from similar resources, staff, and faculty. LAUNCH: Honors Program Collaboration Honors Housing - All participants must be freshmen University Honors students. All participants live together in two residence hall communities. Sophomores and Juniors return to the community as advisors, mentors, and additional support for the freshmen students. College of Education & Human Development Collaboration Education Living Learning Program - Up to 20 students participate in the community each year. All participants must be freshmen in the College of Education and Human Development. All participants live in one residence hall community. Agricultural Leadership, Education, and Communications Collaboration Leadership Living Learning Community (L3C) - Up to ninety students participate in the learning community for one full academic year and can be of any major. All participants complete two one-semester credit hour courses in leadership education, ALED 125 in the fall term and ALED 225 in the spring term. All participants live on one floor of a residence hall community. About 1/10 of the students in this program are recipients of the Regents’ Scholarship each year. About 1/10 are from out of state. Students apply and interview to serve as Peer Mentors for program the following academic year. Academic Success Center - Office of the Associate Provost of Undergraduate Studies Support The Academic Success Center provides "Commit to Success Classes," which are academic success seminars, at least twice a semester within a Residence Life facility. Startup Aggieland Collaboration Startup Aggieland Living Learning Community - Up to 40 students from any major participate in the learning community each year. Students are passionate about entrepreneurship and learn skills to be successful entrepreneurs. All participants live in one residence hall community. Offices of the Dean of Student Life - Health Promotions Collaboration THRIVE: Wellness Living Community is open to all students interested in developing a living environment where they thrive by fostering a community of learning, engagement, and support in wellness-centered activities and opportunities. College of Architecture Collaboration The College of Architecture is collaborating with the Department of Residence Life in designing outdoor study spaces to better support our students. Offices of the Dean of Student Life - Student Conduct Office Collaboration Professional staff members within the Department of Residence Life with with the Student Conduct Office to assist with adjudicating cases, serving on Panels, and investigating more serious code violation allegations. Association of College and University Housing Officers International (ACUHO-I) Exchange ACUHO-I is the Association of College and University Housing Officers-International. ACUHO-I members believe in developing exceptional residential experiences at colleges, universities, and other post-secondary institutions around the world. Several staff members serve on ACUHO-I committees, as well as present at and attend the Annual Conference and Exposition. NASPA, Student Affairs Administrators in Higher Education Exchange NASPA is the leading association for the advancement, health, and sustainability of the student affairs profession. Several staff members serve on NASPA committees, as well as present at and attend the annual conference. National Orientation Directors Association (NODA) Exchange Internships - The Department has worked with NODA Interns who assist with New Student Conferences during the summer months. Aggie Athletics Support Clustered Housing is provided to some athletic groups. The Department of Residence Life also supports Aggie Athletics by providing support staff to work Midnight Yell, advertising upcoming events, sponsoring watch parties and tailgates, and sending students to events. Brazos Valley Goodwill Support Residence Life encourages residents to donate unwanted items to the Brazos Valley Goodwill during move out every spring. Donation trucks are located in multiple areas across campus. Women's & Gender Studies Collaboration The IntersXtions Living Learning Community (IntersXtions) welcomes undergraduate students from all majors who wish to explore issues of social justice and diversity through academic and community engagement. Through service-learning projects, facilitated dialogues, and for-credit courses, the LLC fosters a safe (and brave) space for students to confront a multitude of social inequalities. College of Geosciences Collaboration The Geosciences Living Learning Community (Geo LLC) welcomes undergraduate students from all majors across the College of Geosciences who wish to excel academically by sharing knowledge and building a strong support network, all while participating in fun and engaging activities and events. Dwight D. Look College of Engineering Collaboration The Engineering Living Learning Community (ELLC) is a residential program for first-year engineering students. The ELLC is designed to ease the transition to college by offering academic, professional and social support throughout the freshman year. Academic Affairs Exchange Dinner with a Prof - A monthly program that is open to any TAMU student, a different faculty member is invited to speak to students and share a meal. Faculty are encouraged to speak about aspects of their lives that “made them into who they are today.” This event takes place in front of the fireplace in the Live Oak Lounge in Hullabaloo Hall. Additional events will occur in the South Commons upon completion of the renovation. Colleges of Education & Human Development, Public Health, Engineering, etc. Collaboration Graduate Hall Directors (GHDs) - Graduate students are employed to supervise residence hall staff and students as a means of gaining practical experience associated with their graduate study. Academic Affairs Support Guest Apartments - On campus housing is provided for short term guest stays. Those housed previously include visiting faculty, researches, invited speakers, post docs, and others. Transition Academic Programs, Office of the Associate Provost of Undergraduate Studies Collaboration Housing for Gateway Program Students (Summer Academic Session) - All participants are freshmen who live on campus while completing summer academic provisional requirements. Students are fully admitted to Texas A&M University when and if summer academic provisional requirements are completed/met. Residence Life Staff provides additional support and programming opportunities in order to assist with the transition of Gateway students into college. College of Liberal Arts Collaboration Liberal Arts Honors Cornerstone Living Learning Community - Up to 40 students participate in this program every year. All participants must be freshmen honor students in the College of Liberal Arts. They live together in a residence hall community. Academic Affairs Exchange Sustainability Dinner - Residence Life hosts a dinner for students (Aggie Eco Reps and student leaders) that invites faculty whose research and teaching relate to global sustainability to be guest speakers. This event is hosted annually as a part of the Sustainability Challenge. Chartwells caters the meal using sustainable products and locally sourced food. School of Public Health Collaboration The Broad Street Society offers a select group of high-achieving Public Health undergraduates the advantages of a small, student-centered college education within the context of being a part of one of the largest, most academically diverse and comprehensive educational institutions in the world.